When speaking with Betty King in 2012 about her time in Warriewood and Narrabeen as a girl during the 1930's, Betty remarked when asked: What are the main changes you’ve noticed in Warriewood since the 1930’s? The main change would be the creeks in the valley. The farmers used to spray DDT on the tomatoes and this leaked into the ground and waters. We used to have yabbies in all the creeks, beautiful big ones. We used to get a bit of meat and put a string in and catch yabbies when we first came here. That killed the creeks, they’re just starting now to recuperate. I look at the water and I see it is becoming clearer. The yabby, much maligned by farmers due to its destructive habits in dams and ditches, and for being a 'fish spawn eater', was used by fishermen for bait, was and is still a food for people as well. Nowadays, due to farming and market demands as pets, bait, and a food in restaurants where they are used in ravioli, grilled plain and many other dishes, they are available year round. Their wild or natural season is, when 'wild-caught', mostly in NSW from October to March. What is confidently believed to be the biggest yabbie ever seen in this district was caught in the Government tank here on Sunday, by Mrs. Mortin, of the Tibooburra Hotel, and it measured exactly 163 inches long. It is doubtful whether there has ever been a bigger Yabbie caught in the whole of the Far West. Enquiries since Sunday have elicited the fact that yabbies measuring up to 13 inches In a few ea.-es have been caught. This 16 1/2 Inch 'monster' was secured on Sunday when about twelve people were 'yabbying' In the tank that is almost lull. Mrs. Martin (formerly Miss Cranston of Wertago Station- was naturally excited over the catch. Few in the district failed to see this yabbie and the first question that had to be disposed of was whether it is actually a yabbie. However, there was ultimately no question of the yabbie specie identity. Mrs. Martin caught the yabbie in a net after it had attacked the bait, but the capture was made only after several mistakes with the hand net. The net was applied in the ordinary way. To secure a yabbie about three to six inches. So it was In this case the net was applied to the yabbie's back . instead of Just behind him. Mrs. .Martin had only the front portion of the prey within observation till she landed him.The excitement did not die down for quite a time. People kept calling to see the 'find' and it was measured and remeasured till all were convinced of its exact size. At 9 o'clock on Sunday night the hotel people had yabbie supper! AT the same time as the investigation into the question of exterminating the 'Yabbies'- was being carried out at Leeton by 'Mr. Keith C. McKeown, a settler and Departmental officer at Griffith have also been experimenting. The Fruit Inspector at Griffith (Mr.'P. C. Bottrell) working in conjunction with Mr. D. G. Stark and in collaboration with Mr. G. Beverley, has achieved great success in dealing with yabbies. Mr. Stark is responsible for the original idea, says Mr. Bottrell, who gives full credit to this settler for the scheme which has made the campaign so successful. .This scheme employs bisulphide and practically 100 per cent kill is claimed as a result of the first applications. There has been definitely a 97 per cent, result in test areas. REFERENCE was recently made in these columns to the work of Mr. K. C. McKeown, of the staff of the Australian Museum, in connection with the destruction of 'yabbies' which are often a great nuisance to irrigators on these areas. Mr. McKeown achieved considerable success with the destruction of 'Yabbies' using in his field experiments forms of Derris Powder and extract as well as nicotine sulphate and other substances of the kind which, although fatal in the case of certain aquatic organisms such as crayfish, are quite harmless when brought into contact with other forms of life. All authorities consulted, he states, were unanimous on the question that Derris on warm-blooded animals, even in reasonably strong concentrations, was quite harmless, while very dilute solutions gave satisfactory results in the case of crayfish. The term bisulphide is now outdated, and is usually avoided due to the ambiguity of the bi- prefix most often being used for mixed metal and hydrogen salts. Carbon disulfide is a colorless volatile liquid with the formula CS2. The compound is used frequently as a building block in organic chemistry as well as an industrial and chemical non-polar solvent. It has an "ether-like" odor, but commercial samples are typically contaminated with foul-smelling impurities, such as carbonyl sulfide. Insecticide Carbon disulfide is used as an insecticide for the fumigation of grains, nursery stock, in fresh fruit conservation and as a soil disinfectant against insects and nematodes. Derris is a climbing leguminous plant of Southeast Asia and the southwest Pacific islands, including New Guinea. Its roots contain rotenone, a strong insecticide and fish poison. Also known as derris powder and tuba root, it was formerly used as an organic insecticide used to control pests on crops such as peas. However, due to studies revealing its extreme toxicity, as well as due to the concentration level of rotenone to which the powder is often refined, experts in ecological and organic growing no longer consider it ecologically sound. THE killing of carp and yabbies(crayfish) with D.D.T. Is described in an article contributed by the Entomological Branch of the Department of Agriculture, in the current Agricultural Gazette. Mr. E. J. Wason, entomologist at Leeton, recorded the case of an M.L Area grower who had been using a 0.1 per cent D.D.T. spray and ... allowing- approximately one gallon to drain back into a dam of estimated capacity 25,000 gallons. Hundreds of carp and yabbies were dead along the bank of the dam on the following morning. The fish and yabbies were still being affected and dying twenty-four hours after the D.D.T. pollution. On the basis of the figures given, the final D.D.T. concentration in the dam would be one in 25,000,000.In addition to the interest attaching to this report, it suggests a possible practical method of control of yabbies. Five per cent D.D.T. in kerosene was used extensively in the Northwest Pacific for the control of Anopheline mosquitoes, and the normal rate of application was one quart to the acre. Such an application would kill many other aquatic insects, but was generally considered harmless to fish. (Dichloro-Diphenyl-Trichloroethane) (DDT) was a widely used synthetic pesticide before its usage was banned in many countries, following many campaigns that it is harmful to the environment and wildlife. It is a persistent organic pollutant with a half-life of 2–15 years. DDT was first registered as an insecticide in Australia in the 1950s. A 1972 report from the Australian Academy of Science entitled The Use of DDT in Australiarecommended continued use of DDT where its use clearly outweighed the disadvantages, plus further emphasis on research for alternatives. The use of DDT in Australia has been fully banned since 1987. Although the use of many chemicals in crop production for tomatoes in Warriewood would clearly be the premier cause of the loss of being able to procure a yabby feast from Warriewood creeks today (fishing regulations aside), an examination of the development of land grants and those who first built on these areas of sandplain, escarpment and Mullet Creek flow may indicate others fed poison into the two water courses that converge to pour over at Irrawong and flow as the Mullet Creek into Narrabeen Lagoon. Above: New South Wales. Department of Lands. Parish of Narrabeen, County of Cumberland [cartographic material] : Metropolitan Land District, Eastern Division N.S.W. 1886. MAP G8971.G46 svar (Copy 1). The Ingleside Powder Works and the lands of John Taylor and G J Frankland on one side and the lands of Gustave Adolphe Lix on the other are where the water courses the converge into Mullet creek were. In mid 1885 this Powder Works venture began to fall apart. The lavish house, the lavish entertainments, the procuring of more land, tools and equipment seemed to have emptied the pockets of Von Bieren and, after borrowing more pounds from acquaintances, he fled to Melbourne, stating in parting he was going to purchase sulphur and presses, when in fact he was trying to get out of the country, and succeeded, only to be brought back - the land, as shown in the maps above, went to the directors named. More of this venture is at the link to the Ingleside Powder Works history page. It seems unlikely that any sulphur was disposed of in the creek; what may have been detrimental to the area and escarpment surrounds was the wholesale gathering of grass trees from which the powder would have been made. More about the gentlemen who owned these lands at the time shifts were occurring in the Warriewood valley are in Extras below. One of these, Gustave Adolphe Lix, who came out to Australia from France for the International Exhibitions in Sydney and Melbourne, then stayed on, is shown in possession of 640 acres where one of the origins of Mullet Creek flows towards Irrawong's 'water pond'. 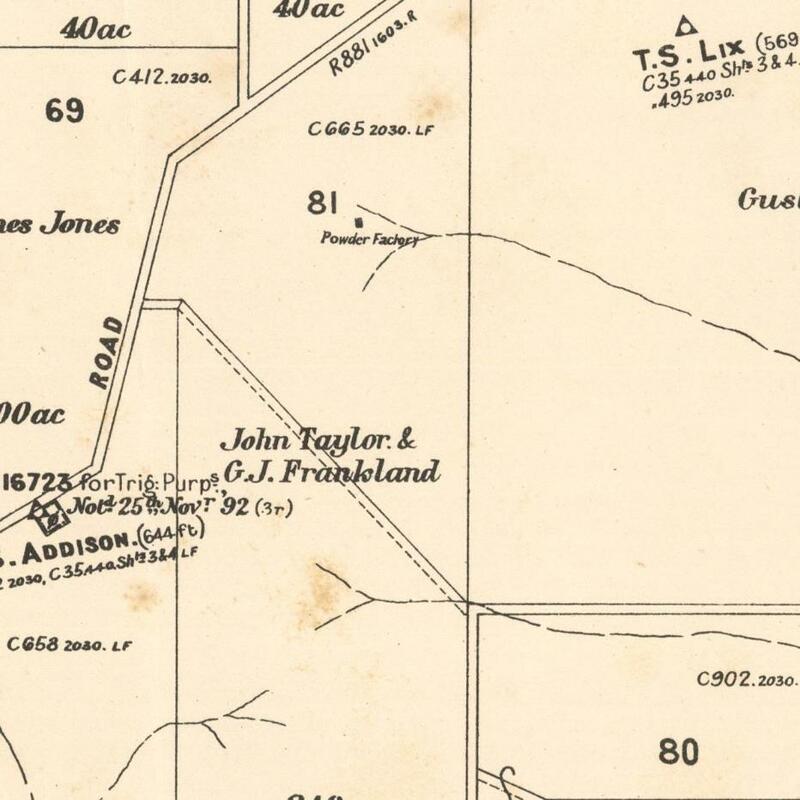 The family that saw a shift towards saving what was being spoiled through ignorance and unawareness of the 'half life' of some chemicals once commonly used in our waterways and poured into the good earth, has a surname of Heydon and it is in a cancelled Land Map of 1905 that we see the 640 acres of Warriewood Gustave Lix land has now been ascribed to J K Heydon. Born in or close to 1836, Monsieur Lix would have been around 50 years of age when hhis name was affixed to land in Warriewood in 1886, the same year Leon Houreaux, another French gentleman 'farmer' and timber cutter in Warriewood prior to then, applied for a publicans licence, and within months of Mr. Lix turning 70 in 1905 - time to retire from hard work in any man's language....or to invest elsewhere....We have found no proof of a connection between the two Frenchmen, but it beggars belief that they did not know each other while in the same valley in the same year and of the same culture. To be noted is Shelagh Champion, OAM, B.A.(Lib.Sc.) and. George Champion, OAM, Dip listing Mr. Lix as a 'farmer' as well in their Profiles of the pioneers in Manly Warringah and Pittwater - 1996, revised 2013. Mr. Joseph Kentigern Heydon, whose death has been reported from England, was a noted Catholic and the author of several outstanding Catholic books. He was also the founder of the firm now known as Felt and Textiles Limited. Born in Sydney in 1884, he was the only son of the late Hon. L. F. Heydon, M.L.C., and grandson of Jabez King Heydon. He was educated in England by the Benedictines at Downside School, and later went to the Massachusetts Institute of Technology in Boston (U.S.A.), where he studied physics. Returning to England he married Miss Alice Leary, and worked as an industrial chemist in London for some years. Later he returned to Sydney, qualified as a solicitor and became his father's partner in the firm of Messrs. Heydon and Heydon. But science was always his first love, and this led him to Interest himself in the processes of manufacturing and eventually to the development of a small textile concern — The Textile Company of Sydney, which has since grown into Felt and Textiles of Australia, Limited, Among chess players it will be recalled that he represented New South Wales in tournaments and enjoyed an international reputation as a composer of chess problems. Mr. Heydon's interest in social and economic questions also dated from his student days. His early book, 'Wage Slavery,' was a plea for co-operation between employer and worker for their mutual good. He supported the Catholic Social Guild in England. By degrees, however, he ceased to believe in the possibility of reform under the existing system, and began to look to the corporative order. LATE MR. L. F. HEYDON, M.L.C. *PNHA along with the Ingleside Residents Association and (the then) Pittwater Residents Association played a key role in preserving large areas of bushland on the escarpment when a major subdivision was proposed, then rejected by Pittwater Council, for the so-called Burrawang Ridge Estate by development company (Healesville Holdings) in 1994 in the most northerly area of the escarpment south of Mona Vale. A further proposal for subdivision around September 1999 was also rejected by the Council, and, after a meeting that the Pittwater Escarpment Committee held at Pittwater RSL in February 2000, a land swap was arranged to compensate the owners. The bushland reserve of Ingleside Park had long been established just south of this land. 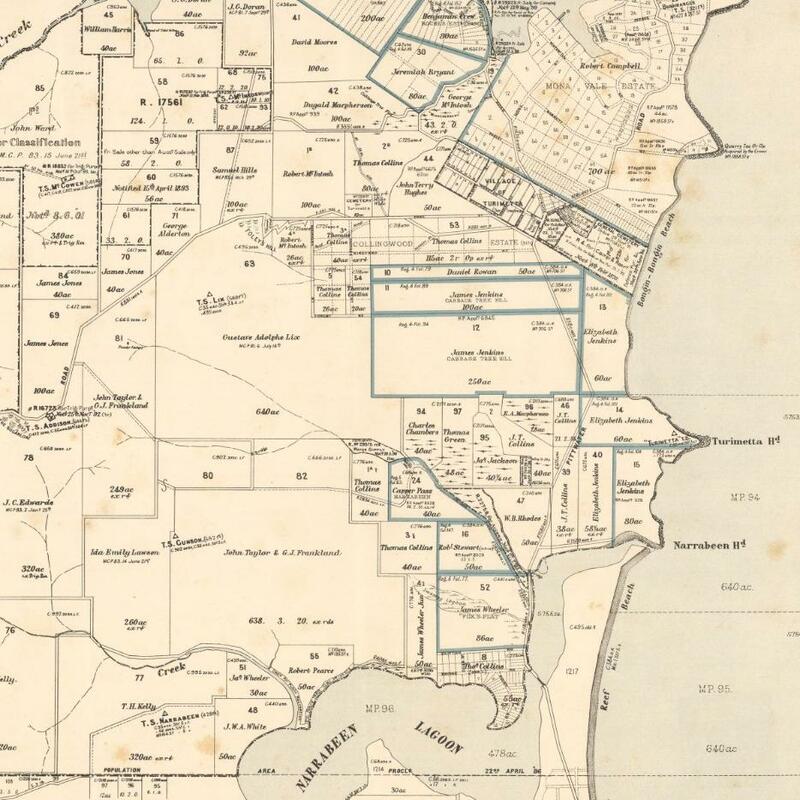 However south of this reserve, another major area of bushland in private ownership, was the Heydon Estate, covering the upper reaches of Mullet Creek. A deal between Pittwater Council, the NSW Government and the owners resulted in this area also being conserved as bushland. So now Warriewood, so changed by housing subdivision, at least has a beautiful bushland backdrop. The success in saving the bushland on the escarpment was a great win-win situation for all - the bushland and its flora and fauna, the people of Pittwater and the owners of the land. Development would have caused enormous damage to the bushland and watercourses for buildings, infrastructure and bushfire hazard-reduced areas. 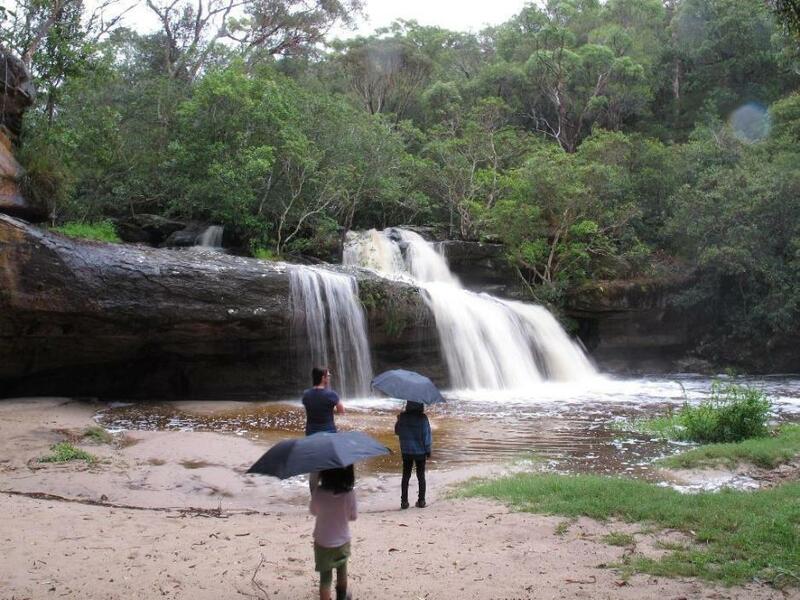 In 2003 PNHA received a grant Community Caring for Warriewood Wetland and Irrawong Reserves for over $24000. This provided for $22 000 of contract bush regeneration work. A generous donation from the son of the former owner of Warriewood Wetland, Henry Roth, contributed to the publication of PNHA's Introductory Field Guide to Birds of Warriewood Wetland and Irrawong Reserves. Profits from this book have provided for at least $14500 for wetland conservation and erection of nestboxes for Sacred Kingfishers. Our regular Breakfast with the Birds activities began with this grant and continue to be very popular. *This information is courtesy of Marita Macrae of PNHA, one of those who was there. Part of Pittwater Environmental Foundation’s Mullet Creek Large Project grant work involves fauna surveys of the catchment. In February (2013) a rare Giant Burrowing Frog was located near the creek's northern arm. "Giant" for a frog means the body is about 10cm long. This survey was undertaken by Tracy Chambers and Chris Jolly, took this photo. The Late Mr. G. J, Frankland. On Tuesday evening, at The Pines, East Maitland, Mr. G. J. Frankland, late of Mowbray, Paterson, breathed his last. He had lain unconscious and without pain, since Sunday at midday. His family, of five— three daughters and two sons, and Mrs. Frankland — were with him when he died, and Canon Shaw, of St. Paul's, Paterson, was a visitor on Monday. Mr. Frankland’s history is a very interesting one. He was born in Pitt-street, Sydney, in September 1823.. His father Captain Frankland had arrived with his young wife in the brig Ann, owned, sailed, and freighted by himself, a couple of years before. And, after selling his cargo and engaging in trade for three or four years, he determined to settle down on a grant of land which he secured. The first grant was in Tasmania, but he was advised to get it transferred to New South Wales, Tasmania being a small place, and never likely to be anything but a convict settlement. Ho therefore selected a site for his homo on the Paterson river. Leaving his wife and young son in Sydney till he built a house at Mowbray— so called from his native village in Yorkshire — he established himself in the then remote locality beyond Paterson. In 1825 Capt. Frankland went on a business visit to Sydney. When he was expected back, his wife sent the rowboat to Newcastle to meet him. When the long delayed sailing vessel by which he was expected arrived, it brought news of his death. The widow, with her two little sons, determined to return to her friends. On the way home a third son was born, off, the Falkland Islands. Of these sons, the subject of our sketch was The last survivor. He was educated at North Allerton Grammar School and Wakefield College. After leaving school, he spent three years in a bank, and sailed for New South Wales in 1844. The barque sprung a leak, and put into Porto Praya for repairs, arriving in Sydney eleven months after starting. In 1845 Mr. Frankland started to gain ' colonial experience' by taking a lot of cattle to the Clarence River. In 1840 he sailed again for London, and accepted a position with a firm of Shipping Agents, where he remained till 1852. He then returned to Australia, and accepted a similar post in Sydney, remaining' till 18B0. He returned to England and remained there for two years, returning to New South Wales in 1863, since which date ho lived at Mowbray, till he sold it in August last. When in England the last time he became engaged to 'Miss Mary Stevenson, a Yorkshire lady. ' After arranging for her to follow him, escorted by the late Hon. Thos. and Mrs. Walker, of Yarralla, Concord, he hastened buck and built the present house as a home for his English bride. Miss Stevenson duly arrived, and the wedding took place at Yaralla. In 1873 Mrs. Frankland died, leaving two sons and three daughters living, and who still survive Mr. Frankland remained a widower till 1889, when he married Miss Phoebe Cobbett, daughter of the late Mr. E. J.Cobbett, K.B.A., an English artist of distinction. Mr. Frankland,'s health has been generally good, but of late he has suffered from weak sight and Slight deafness, but his mental faculties were unimpaired to the last, and he succumbed at last to senile decay, calmly sleeping away. Till advancing age advised rest Mr. Frankland was active in church work and in the public life of the district where he resided. For many years ho represented the parish' of Paterson in' the Synod of the Diocese of Newcastle, and ho was justice of the peace also for many ' years. Ho was an excellent neighbour, a considerate employer, a faithful friend, a kind father, and a hospitable host. Conspicuously courteous- in demeanor, with fine manners which people sometimes called old fashioned, a shrewd observer of won and events, conscientious in the discharge of duty, a practical Christian, the Squire of Mowbray was a pattern to his fellows. ?? The' phrase ' A fine old English gentleman' aptly described him. He parted with Mowbray only a few months ago, his life being practically ended in the locality which was favoured by his lengthened residence within its boundaries. All Mr. Frankland's family are grown up, and three are married. Mention is made above of the voyage up the river to Mowbray, undertaken by Mr. Frankland's father in 1824. We may here conveniently use some notes of a conversation with Mr. Frankland a few years ago, embodying reminiscences of his life. The manuscript was submitted to Mr. Frankland after we had written it,' but has not before been printed. Captain Frankland, as has been said, in 1824 sailed in a small vessel called the Fame, from Sydney, to occupy his grant, then the farthest out on the river. There was at that time no hotel at Newcastle, and Captain Frankland appointed the hospitable entertainment extended to him by the commandant. He came up the Hunter in a row boat, having for companions, besides his servants, Mr. Siddleton, Captain Grimes, and Mr. Edward Cory. The present site of Morpeth was known uu tho Green Hills, a designation which lived till within a few years back, but it is now never heard. There was no settlement at Morpeth, and the party camped at a hostelry of Nature's gilt, at the junction of the Hunter and Paterson luivei-ii, a great hollow tree. Covered with their bout clonks, they slept in the bout. A sail was rigged for the progress up the Paterson, and a favourable wind curried tho voyagers many miles on thoir way. Here and there they passed settlers wharfs, and occasionally a cull was made. Eventually, Captain Frankland reached his destination, and set himself to prepare a dwelling for his wife and young son, who were left in Sydney in the meantime. The river was, at that early time, the only highway. There were no roads...... 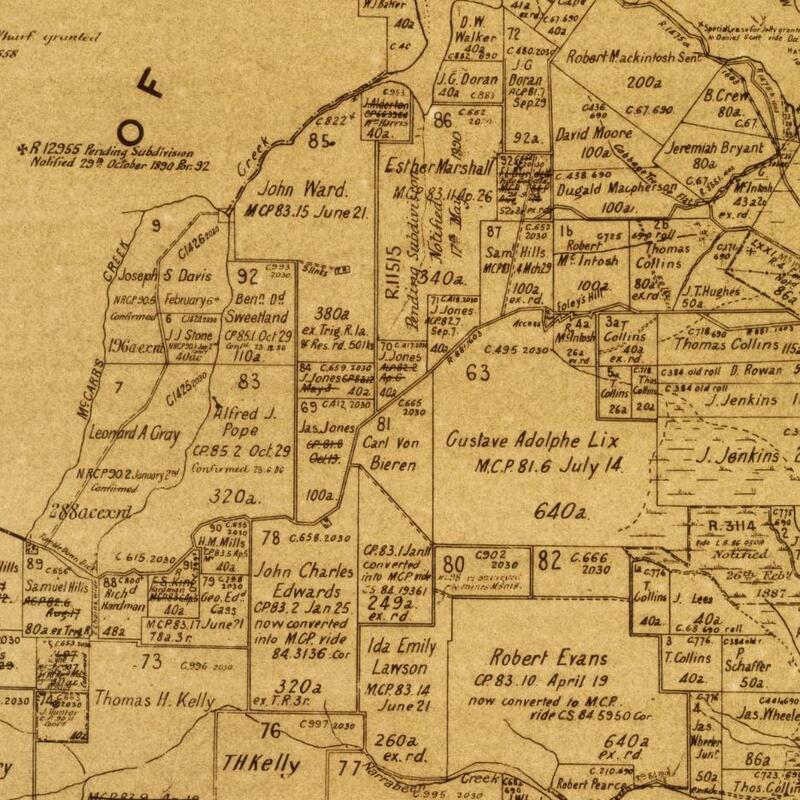 There was no township of Paterson in 1814. Settlement began to proceed slowly between 1825 and 1830. The first visitors and explorers of the district passed the rich and fertile lands on the Hunter and came on to the Paterson, scared by f oar of floods. Very great floods had left their marks in the trees on the Hunter ....The brushes which occupied the flats held back the water. Blacks and bushrangers were alike troublesome at the time of which we are writing. Photograph - French Court, Great Hall, Exhibition Building, 1880-1881, Reg. No: MM 107833, courtesy Museum of Victoria: View of the exhibit of Christofle & Co. in the French Court in the Great Hall at the 1880 Melbourne International Exhibition held at the Exhibition Buildings, Carlton Gardens, between 1 October 1880 and 30 April 1881. In addition to the main permanent Exhibition Building, two permanent annexes as well as a large, central wooden temporary annexe was constructed to house the courts of various countries, or to include larger items from countries already represented in the main Building. France had courts in both the main Exhibition Building as well as in the central temporary annexes, on the western side of the main avenue between Great Britain and Germany. THE dam built across the little creek was at first bare and life-less when the stock came in to drink, but soon a fringe of green edged it; deep black mud covered the yellow clay bottom, reeds and water lilies appeared, and it swarmed with crayfish. The feet of waders, sticky with spawn and seed-bearing mud from distant waterholes, no doubt first populated the new dam. The swarming aquatic life did no harm, nor did the birds that fished and bred there; but the station overseer, always half preoccupied with the water problem, cursed the crayfish. Their burrows went farther and farther into the clay banks till here and there a wasteful seepage began to moisten the outside. Sometimes the station children came down with nets and lines-yard lengths of cotton with raw meat baits tied at the end-and they would half fill a kerosene tin in an afternoon. But the crayfish more than held their own. It was here that Yabby was born, one of the teeming crew in that fierce competition for food and life, and, by mere chance, one of the survivors. The narrowed tail showed him to be a male, and as he grew his almost trans-parent, water-coloured suit of armour plate changed to a darker and darker green. The time came when the fugitive stage was over, and he became one of the aggressors in a world where might was the only right. THE crayfish population were not always abroad hunting, in spite of their astonishing appetites. They disliked water which was very warm or very cold, and would remain in the muddy burrows, or lurk deep among the weeds about the edges. During most of the winter they stayed half torpid far under the banks, and during the heat of midday in summer the water birds knew that there would be but poor fishing. claws ready. At the first sign of danger they would reverse gear and go darting backwards, tail first, always raising a "smoke screen" of fine mud which completely hid them. Many of the females carried a mass of soft, jelly-like eggs under the tall leaves like a bunch of diminutive grapes. The tiny young, resembling the grown-ups as soon as born, kept to the shallows, and were very hard to see at all, for they were exactly the almost trans-parent colour of the water. Yabby himself, now an experienced warrior of the crayfish people, had long learnt the need of extreme .cau-tion, for night and day the place swarmed with enemies. Where Might is Right. HERONS stalked along the edges with stiletto bills, held ready for the thrust. The tall Jabiru loved crayfish, the bittern hunted for them among the reeds; the shag dived for them. Towards evening the water-rat was abroad; and all night long the nocturnal nankeen heron was at his fishing. But Yabby, too, was perpetually hungry, and of late the competition was becoming keen. Nothing, living or dead, came amiss as food. When a weak sheep became bogged and finally sank, smothered in the mud, befouling all the dam and Indeed the whole neighbourhood, Yabby and his fellows gorged Inside the carcase for weeks, stripping the bones bare. The more rotten the offal the more they loved it. He had seen the "old men" of his clan, huge green and spiky fellows, even kill small swimming animals, and once, ferocious with hunger, he had stalked a young water-rat, gripped it under water when it dived, held on grimly till it was drowned, and then feasted. More than once, too, in the lean times, he had set upon a female crayfish, gripped her with his great pincers, and devoured her. It was always females who were eaten by males, for they were callous cannibals. They simply had to eat, and there was no fellow-feeling among them, no esprit de corps, no chivalry. It was Nature’s old ruthless law-each for himself. YABBY was able to feed, to mate, to survive, only by this utter ruthlessness, for the place was becoming overstocked. Fights with big fellows like himself became more and more frequent, and twice he lost a claw in single combat, and had to Ile low in semi-starvation till the huge nipper grew again. There was too much cover for the wading-birds to keep the balance of Nature here. But Nature has always a way. Sometimes large and strong members of that crustacean community simply disappeared, none know how or where. And as the place became more crowded and the competition too keen a dim racial instinct stirred in Yabby. He, a water animal, would leave the water. He did not plan; he simply obeyed a wisdom greater than himself, a blind but infallible instinct. And instinctively he chose exactly the right time. One evening, just after rain, when the bush was drenched with moisture and the skies clouded, he lumbered up a log at the edge and went ludicrously up and over the bank and off across the paddock. He breathed by gills and could not breathe air direct, but the grasses were wet, and he felt no discomfort. Under the cover of the friendly darkness he gain-ed the timbered country, and all nightlong he shambled awkwardly forward, slowly but purposefully, and always in a straight line. BY dawn he was some hundreds of yards away from the home dam, and before daylight he was well hidden in a moist clump of undergrowth. But no sun appeared; a drizzle set in, and Yabby once more went shuffling for-ward over the unfamiliar world of solid things, but careful of cover now. He was a fish out of water, a triumph of instinct. Once a young fantail spied him crawling through the grass and plopped down beside him, staring. Yabby backed and raised his great front claws, his long feelers waving. The young bird propped back on its tall, gave a startled squawk, and vanished. Most of the day he travelled through the wet forest and all the next night, uphill and down, over rocks and sticks, under logs and debris. By daylight he had travelled more than a mile overland, unerringly to the unknown goal. He came downhill at last to where a long permanent waterhole lay level in a creek bed. 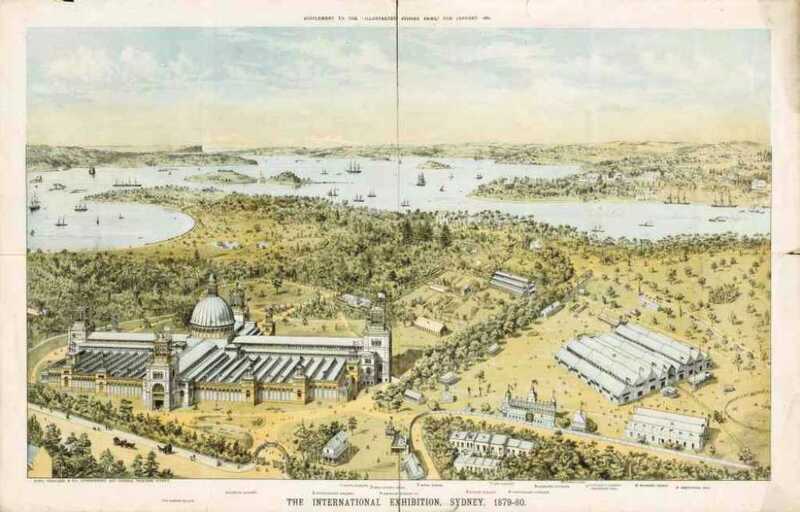 'The International Exhibition, Sydney, 1879-80,' supplement to Illustrated Sydney News, January 1880. Chromolithograph; Image No. : 8336600, courtesy National Library of Australia, Canberra. Yabbying and Eeling in Warriewood's Creeks - threads collected and collated by A J Guesdon, 2014.